Dave Hamilton of Bradford Night Owls SC watched the film Apocalypse Now in 1979. 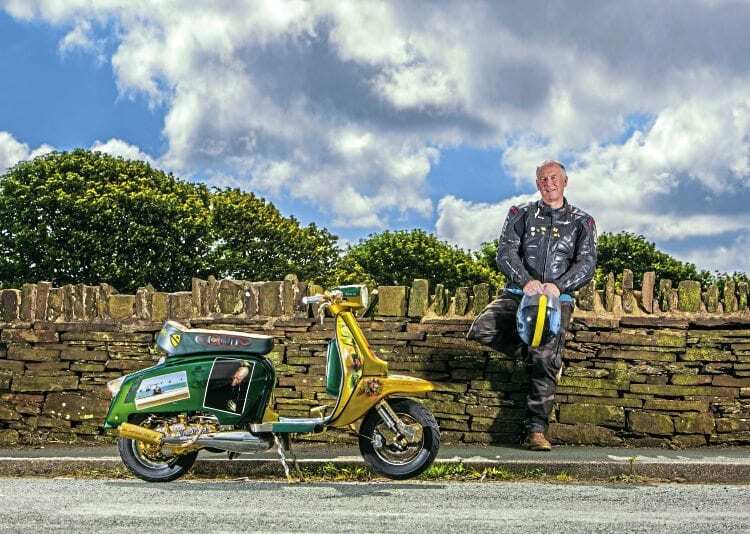 He didn’t realise it at the time but he would be so inspired by it that it would form the basis for a custom scooter he would start to build in 2008. As the rebuild developed the whole concept of Dave’s planning and choices was beginning to come together. 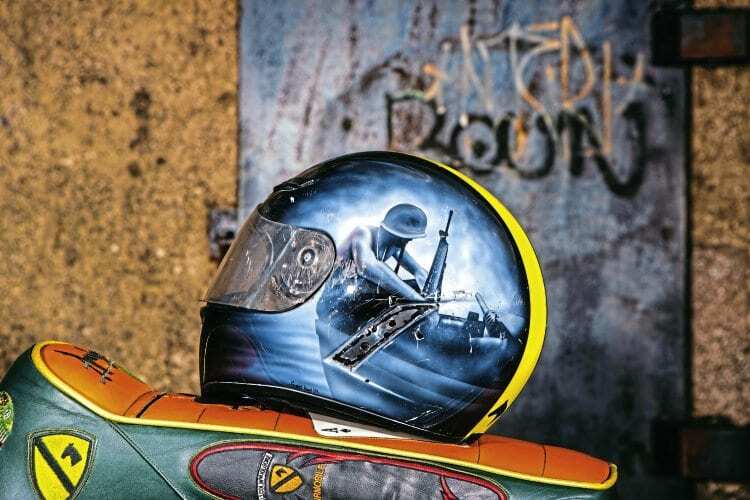 Dave said: “I wanted to create a blend of murals, and phrases from the film, which were supported with similar engraved features on the scooter. 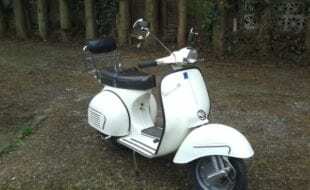 I wanted it to be a custom scooter, which you’d walk round and you’d develop the picture of the theme as you looked at it, and the longer you looked at it the more features you’d begin to see. 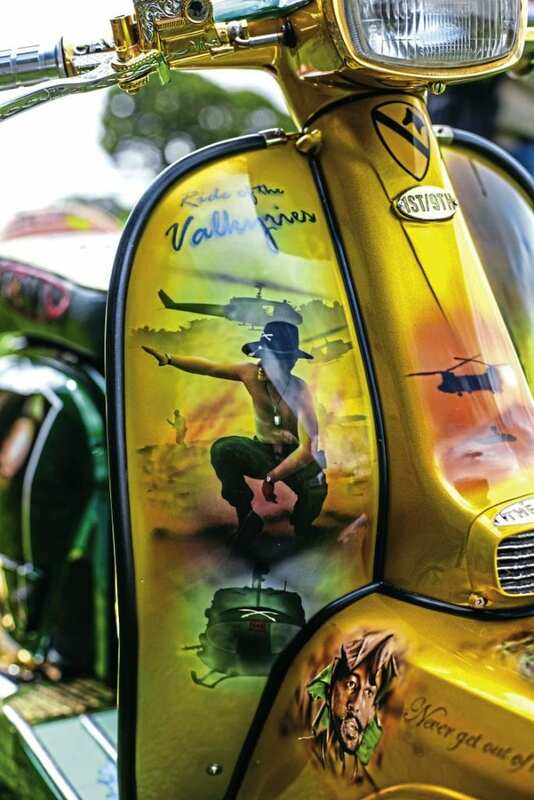 The base coat at the front of the scooter is metallic gold candy. The base coat at the rear and on the side-panels is metallic green candy. The green represents the humidity of the Vietnam Jungle, and the gold candy represents bomb explosions and landing zone flares. Once you’ve been drawn into the theme by the base coats the fantastic murals of Grant Hood, Colin Fitzgerald and Ty Lawer take you into the movie itself. 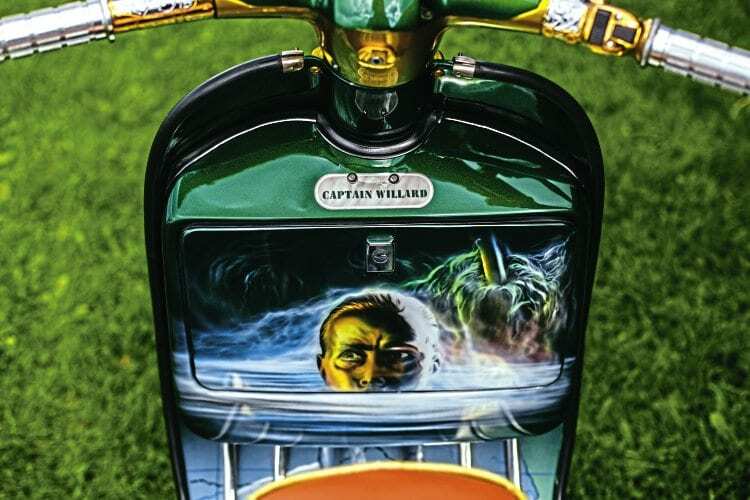 The front of the legshields reveal murals of Marlon Brando’s character Colonel Kurtz and Lt Colonel Kilgore in the classic ‘surf or die’ scene. On the right side-panel there is ghosted image of Lt Colonel Kilgore set between the Air Cavalry’s attack formation and another menacing image of Kurtz. 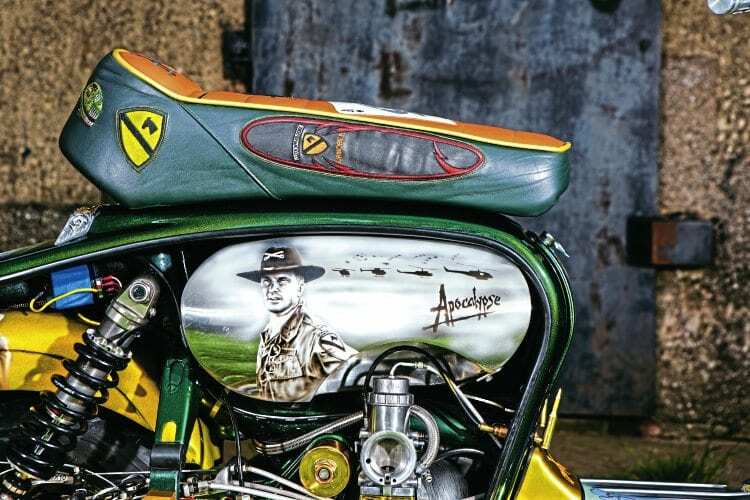 On the left-side panel there is a ghosted side profile image of Captain Willard and several ‘Huey’ helicopters set between murals of Lt Colonel Kilgore’s deployment from his helicopter, ‘Death from Above’, and Lance B Johnson in the patrol boat’s twin 50 cal gun position. 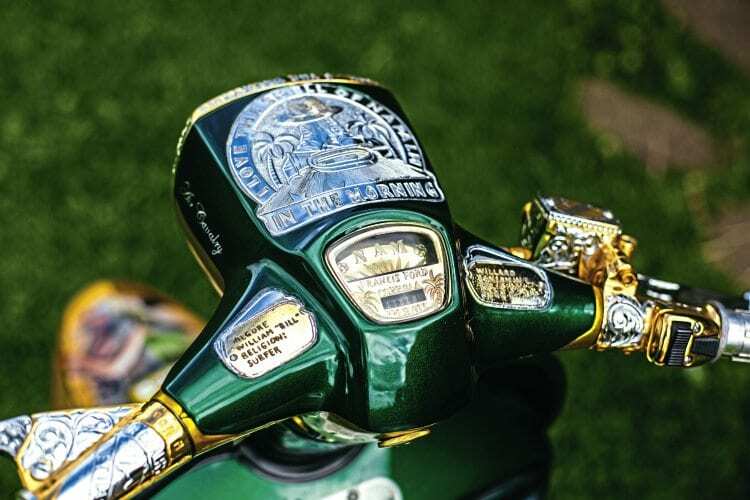 The sharp shine of the chrome gives the feel of the sun glistening on the Nung River and the gold plated metalwork around the scooter supports the flashes of explosions. I asked Dave about the paintwork on the inside of the legshields. He said: “I knew exactly what I wanted on the tool box door but I gave Grant carte blanche on the rest of the inside area. 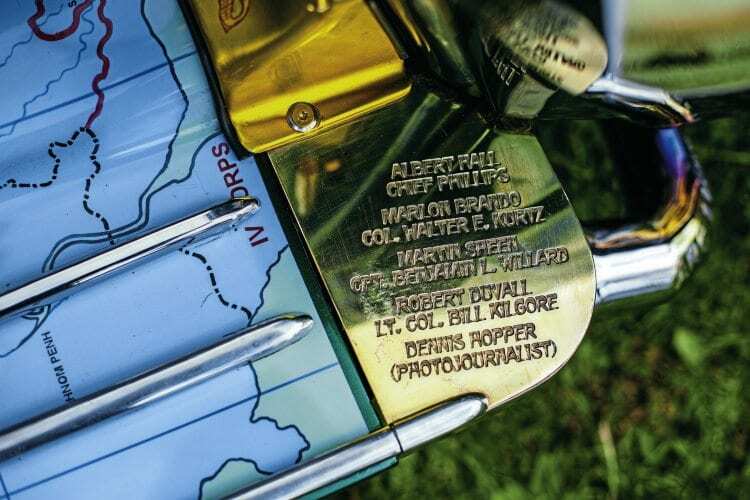 Grant came up with this idea, which is a map showing the Nung River, which Willard travelled up in his mission to track Kurtz down, we both agreed it worked.” Dave went on to explain that this was another example where the specialists he’d commissioned to work with him had done their research into the theme and positively contributed, developing their ideas into the scooter. Since the original engine build, Dave has upgraded to an RB20 kit with a Wossner piston. The scooter’s pretty keen on fuel so Dave had the foresight to fit it with a 17 litre long-range petrol tank. 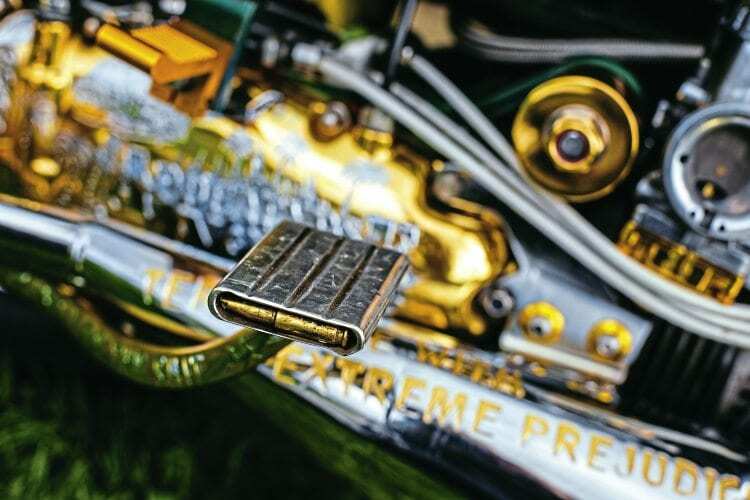 Under the headset is a brass kit by MB Scooters, and a Taffspeed upper steering bearing. Explaining the brass kit and the steering bearing Dave said: “The brass kit improves the gear changes and increases the response to the throttle by so much you wouldn’t believe! 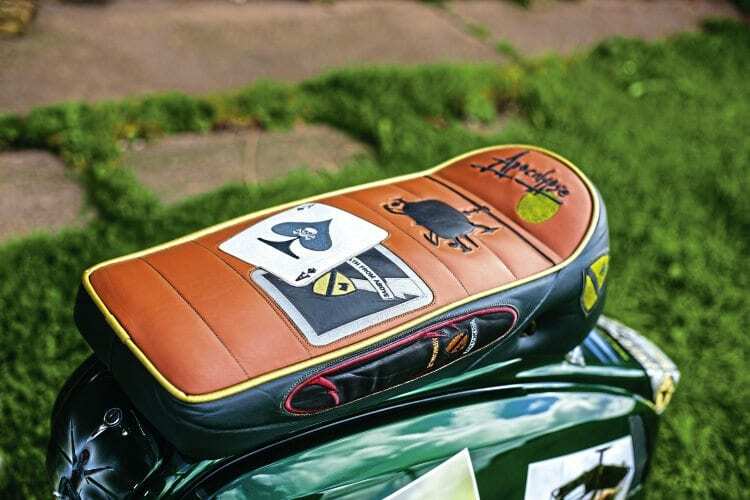 And the upper steering bearing improves the whole integrity of the ride.” The existing flywheel cover is a one off item, which has the swords of the Air Cavalry running across it. However, Dave explained that he intends to replace this with a Casa mag flange flywheel kit. 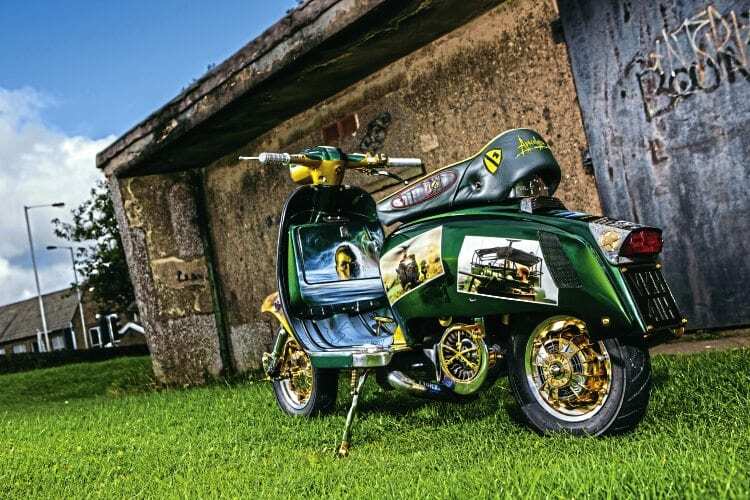 The number of features Dave has developed into this scooter is unbelievable. 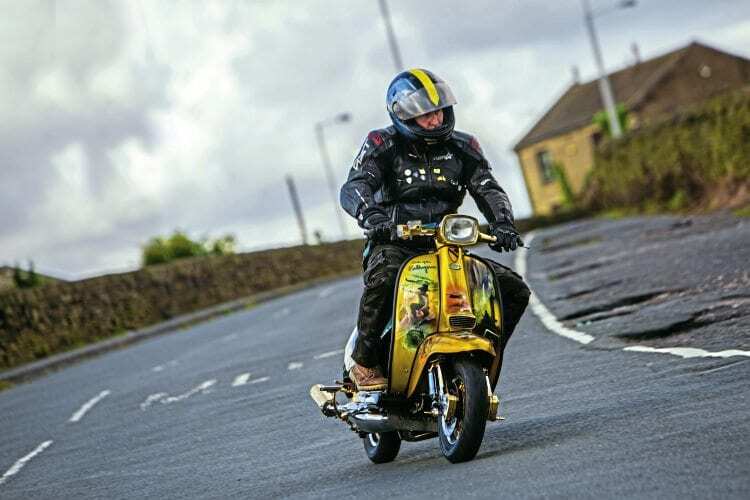 Dave’s mission was to produce a top-end custom scooter, and he found his inspiration for its theme from a film he was passionate about. His passion drove him to think carefully about every step he’s taken with the development of ‘Apocalypse’. He did his research and kept his focus. He wanted the scooter to be one which you’d walk round and it would immerse you in its theme and that is what happens with ‘Apocalypse’. 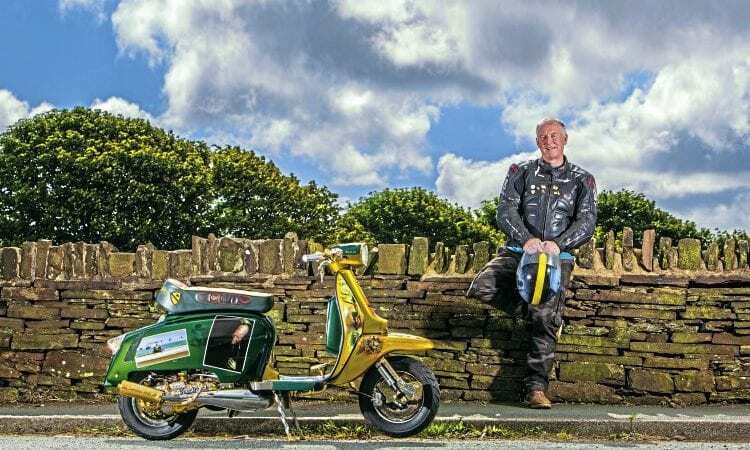 Scooter club: Bradford Night Owls. 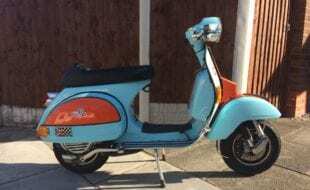 How and when did you first become interested in scooters: 1979, when I was 16-17 years old I watched Quadrophenia and that set things going. 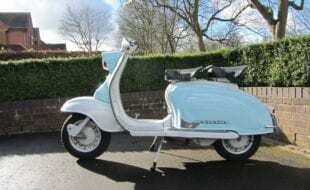 First scooter: Lambretta GP200 purchased in Bradford for £200 in 1979. 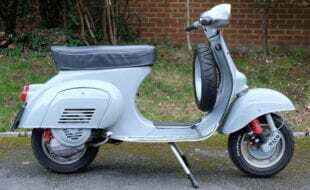 Favourite scooter model: Lambretta GP. I love the lines and the shape. First rally or event: Scarborough 1980. How did you get there? 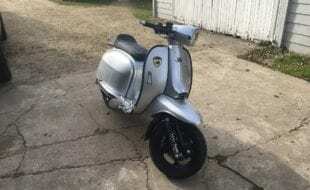 Vespa P200E. 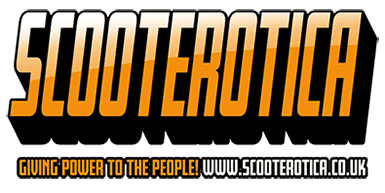 What is your funniest experience with a scooter? In 2014 we were going to the Scarborough National Rally when we got stuck in a traffic jam on the A64. Me and my mates pulled out to the right and filtered through the line of traffic. We’d got about two miles when we realised one of our group was missing. We pulled in and eventually, two pints later he caught us up. The problem was that his scooter was loaded up with lights and mirrors and he couldn’t squeeze through the gap between the cars! What do you like about rallies/events? The music, the scooters, the people and the craic in general! What do you dislike about rallies/events? Moaners! 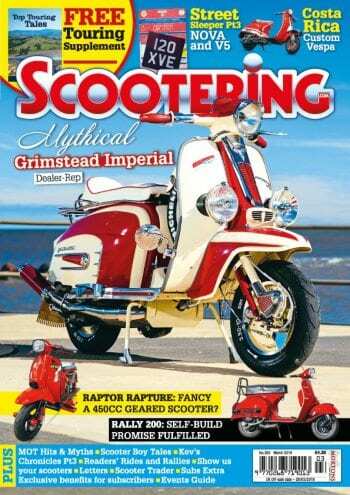 What’s your favourite Scootering magazine feature: Custom scooter pages and technical tips. 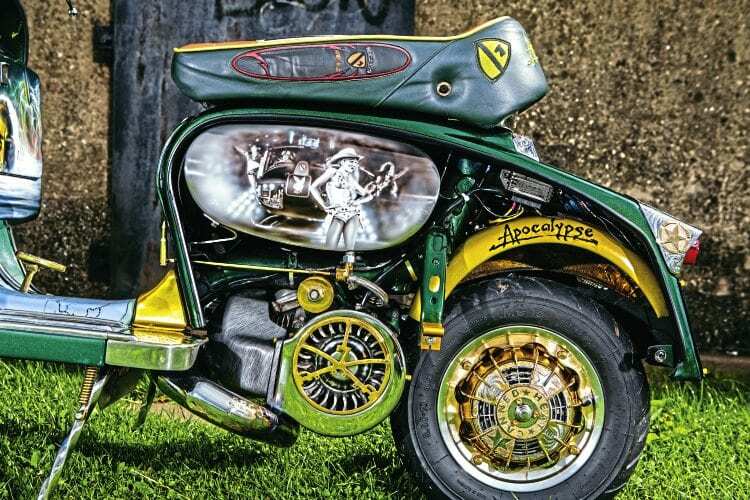 Your favourite custom/featured scooter of all time: ‘Spirit Walker’. 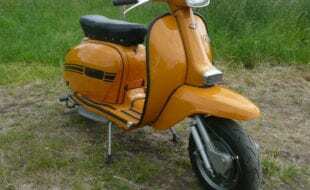 Scooter model: 1970 Lambretta GP125 (Italian). Date purchased & cost: Barn find in 2008. Cost £900. Inspiration for project: The 1979 film Apocalypse Now. Time to build & by who: Currently, about nine years. Crank: AF Rayspeed race crank. Describe engine performance and power delivery: Smooth and clean. Top speed & cruising speed: 75-80mph. Paintwork & murals done by: Original paintwork by Grant Hood. Additions by Ty Lawer and Colin Fitzgerald. Is there any engraving done by: All by Adi Clarke. Is there any chrome: Chrome by Karl Russell — Quality Chrome. Gold by Scott at Pure Gold Plating. Released in 1979 Francis Ford Coppola’s classic cult movie Apocalypse Now explores the madness and moral dilemmas of the Vietnam War. Captain Willard (Martin Sheen) is an American Special Forces officer who is sent on a secret mission to kill the renegade Colonel Kurtz (Marlon Brando). Kurtz has gone off the rails and has surrounded himself with brainwashed natives in a jungle fortress. Willard’s journey up the Nung River brings him into numerous situations, one of which is contact with the bloodthirsty, battle-hardened, surf loving Lt Colonel Kilgore (Robert Duvall). From 1965 to 1973, the Bell UH-1, officially named ‘Iroquois’ and nicknamed ‘Huey’ was the most common utility helicopter used in Vietnam. Typical armament included two M-60D machine guns on fixed door mounts manned by the crew chief on the left and a door gunner on the right. The M-60D is a 7.62mm calibre weapon, which fires approximately 600 to 700 rounds per minute. The large ammunition box magazines below the M-60s could hold roughly 2000 rounds of linked 7.62mm ammunition, and were a typical field modification replacing the authorized ‘can’ which held just 500 rounds.